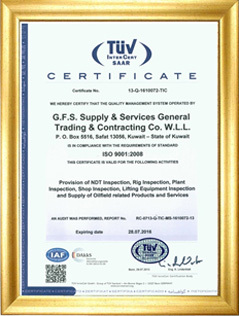 We at GFS Supply & Services Company are committed to providing various Inspection services including NDT Services, Rig Inspection, Plant Inspection, Shop Inspection, Lifting Equipment Inspection & Certification and Supply of Oilfield related Products and Services by fulfilling the customer requirements in a timely, accurate and cost effective manner. We are committed to our customers for error free service and timely delivery every time. We are dedicated to complying with and continually improving the effectiveness of the GFS Quality Management System as per ISO 9001:2008 requirements. This will be achieved by employing effective project management skills for execution of projects as per customer requirements. Our prime motto is to continually improve our products and services with the objective of improving customer satisfaction & operational efficiency with the active involvement of all our employees.